John Fogerty is streaming his new single, “The Holy Grail”, featuring guitar work by ZZ Top legend Billy Gibbons. "For me as a musician, swamp boogie is the holy grail of music," Fogerty tells Rolling Stone. "This sound captured my soul from a very early age. I couldn't think of a better artist to conjure the vibe of the swamp with me better than the one and only Billy F. Gibbons." "Getting together and collaborating with John Fogerty to create a new song called 'Holy Grail' is a tangible dividend from the Fogerty-Gibbons exchange," adds Gibbons. "It's classic electric-guitar chops with an electrifying climax." 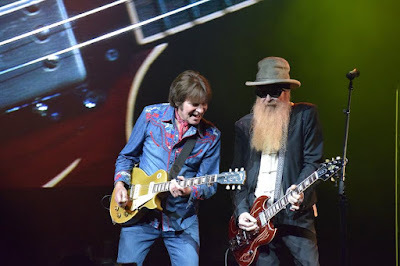 The pair recently delivered the live debut of “The Holy Grail” during the first few shows of their joint Blues And Bayous Tour; the five-week US run sees Fogerty and ZZ Top taking turns closing the show each night before it wraps up in Welch, MN on June 29. “Selfishly, this is just a bucket list thing for me,” admits Fogerty. “I'm really looking forward to jamming and becoming intimately aware of their music and all the little things that happen during their set.